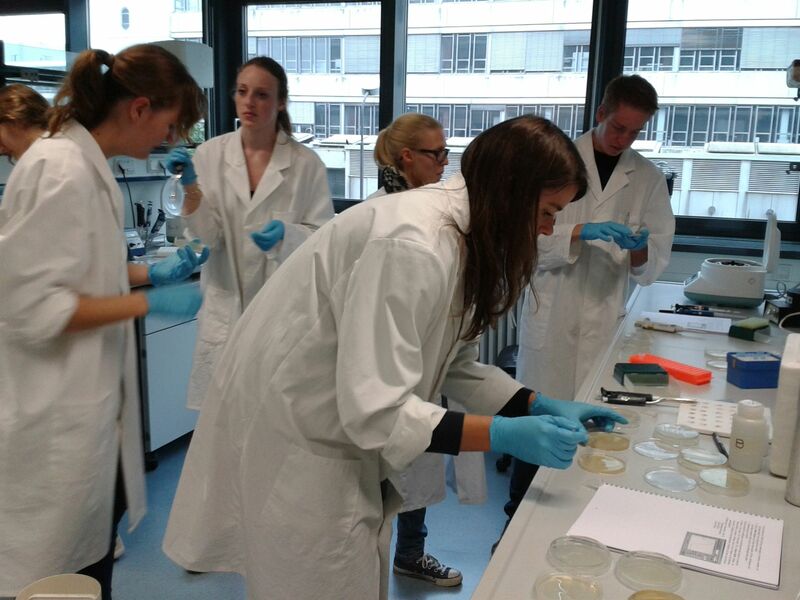 This year, the third CeBiTec Pupils Academy took place at the Centre for Biotechnology (CeBiTec) in Bielefeld. This project is established by the CeBiTec in cooperation with the “Familie-Osthushenrich”-Foundation and the district council of Detmold. The District Council of Detmold establishes the contact to schools for qualificated scholars while the CeBiTec organizes the theoretical and practical part of the week. Several aspects are touched during the week like for example modern plant research and energy from biomass. The main focus lies on systems biology and synthetic biology. The scholar academy gives 20 young, aspiring pupils a widespread insight look in synthetic biology and iGEM. Besides they received a first overview of the day-to-day life of a student. The academy was structured in different seminar lessons and experimental courses. In the seminar lessons we introduced the audience to our team, iGEM and the project. We prepared one out of four courses. We prepared four basic biotechnological experiments. Before the experimental part started, we presented the theoretical foundations and our project to them. The experiments were divided into two parts. 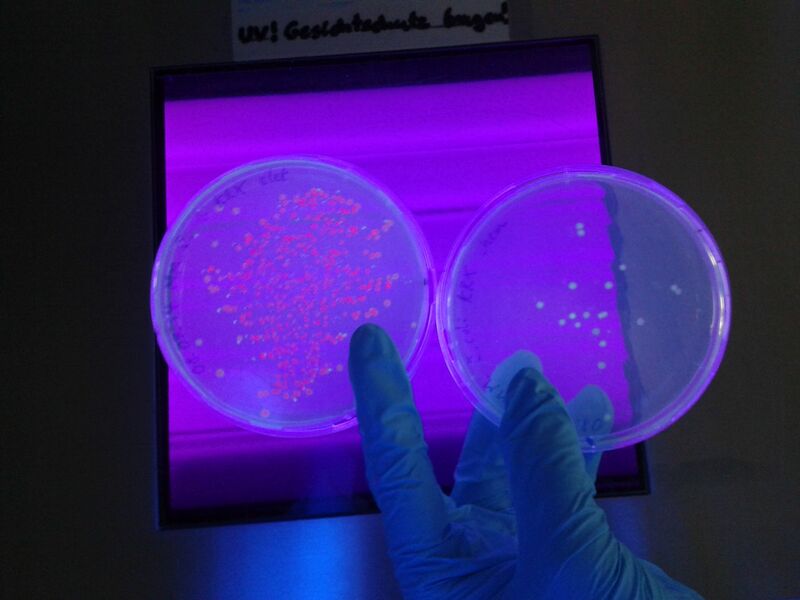 In the first section the pupils executed a transformation of mixed plasmids in E. coli DH5α via electroporation and by heat shock. The mix contains pSB1C3::RFP and cp46::GFP. pSB1C3::RFP carries a chloramphenicol resistance and cp46::GFP carries a kanamycin resistance. Because the transformed bacteria were plated on LB-plates without antibiotic, as well as with chloramphenicol or kanamycin, only respective bacteria were growing. On the day of the analysis of the results the pupils should decide which antibiotic resistance is located on which plasmid and conclude the resulting reporter gene. In the second part the pupils had the opportunity to isolate plasmids from a liquid culture with a miniprep-kit. For the experiments they had a script. Working along this they were encouraged about the transformation methods and the ingredients of the used plasmid miniprep-kit. Of course we tried to elate them to ask as much as they wanted. In addition to present our project to them, we took an advisory role for all questions around studying. Therefore a get-together-dinner was organized. The dinner was used to get in a closer contact to the scholars besides the lab work. Many of them used this chance to make questions about the life of a stundent and our chances for the future. It was an interesting evening with many questions and many answers. fig. 3: RFP and GFP resulst as expected! 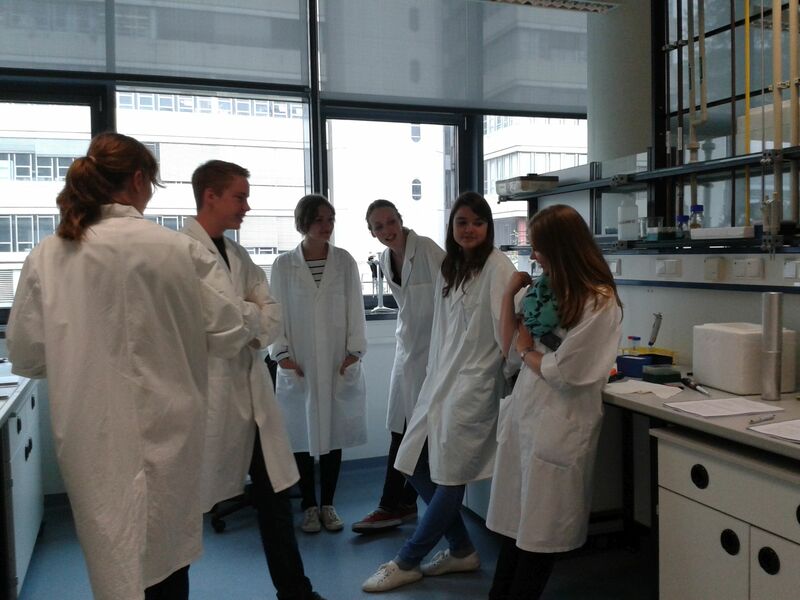 For us, the best thing was to get in touch with the motivated pupils and to inspire them for the concept of iGEM. It was interesting to realize how important such a competition is for the right choice of the study in the area of biotechnology or bioinformatics. Because with iGEM you can carry out a project of your choice. This is a major advantage for a biotechnological masters course. All in all we had lots of fun to take care of the pupils. We got the impression that we organized an interesting and funny week to them. The discussions with them and their questions about synthetic biology and our project gave us the chance to refine the way we communicate science in the iGEM competition.